It's #ThankfulThursday and we are so grateful to our committed online shoppers who use donation portals every time they shop online. What's a donation portal, you ask? 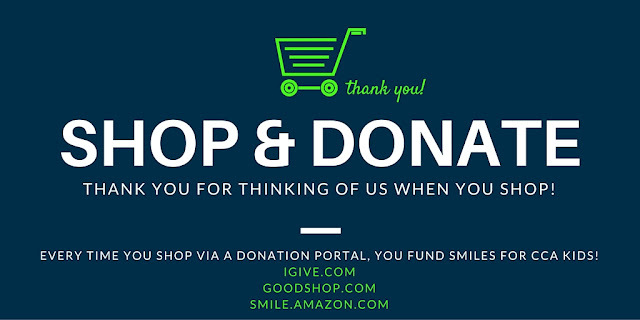 When you shop through special links - iGive.com, GoodShop.com and smile.amazon.com - and select CCA as your charity of choice, a portion of your purchase will go to CCA each and every time! It's incredibly easy to make an impact, just make sure you bookmark these links so you never forget to shop via the donation portals. It may seem small, but when our whole community participates the funds really add up. Here are three main ways to "Shop to Donate" for CCA. First, shopping via Smile.Amazon.com for your everyday needs helps send more kids to surgery and to Retreat. It's great to know that when you are buying your daughter's textbooks, a new carrier for your pooch, and your TP in bulk, that those every day items are bringing smiles to CCA Kids' faces. Next, shopping through GoodShop.com will allow you to shop your favorite retailers (Gap, Bed Bath & Beyond, Edible Arrangements, Vistaprint... and more!) and access their excellent coupon offerings. Plus, did you know you can also book travel via GoodShop.com? Higher value purchases mean even more money goes to support CCA Kids. Get a jump start on your holiday shopping, and get a $5 extra bonus for Children's Craniofacial Association, on top of the normal donation amount. Just purchase a total of $100 or more from any of over 1,700 great stores by November 1 (Amazon not included, sorry). Doesn't have to be just one purchase, doesn't have to be just one store. So long as you buy $100 or more, in total, we'll give that extra $5 bonus to Children's Craniofacial Association. It can be travel, it can be gifts. It can be frivolous, or it can be something you really need. Your purchase will mean $5 plus an additional donation of up to 26%. From Expedia to Etsy, Macy's, Nordstrom, and JCPenney... Over 1,700 stores that want to help you and help your worthy cause or charity. So what are you waiting for?! It's time to get your shop on... and we THANK YOU in advance. October is all about Choosing Kind!